Become a part of the most exciting a cappella chorus in Colorado, and you’ll start on a musical journey like no other. We sing, we harmonize, we entertain, we travel the country competing with the best of the best in the Barbershop Harmony Society and we come away with medals – and memories. Our society’s motto is “Keep the Whole World Singing” and our performances and outreach efforts bring this motto to life. A chorus community is like no other. Our membership is a diverse family of men of all ages who have two things in common: the love of a cappella singing, and a genuine concern for one another. Members come from all backgrounds and levels of music training in either voice or instruments. So, when you join Sound of the Rockies, you become part of a family with distant cousins from choruses around the world, who will be happy to harmonize with you wherever you go. We encourage prospective members to attend a few of our Thursday evening chorus rehearsals. This will give you the opportunity to experience our enthusiasm for creating beautiful music and world-class performances. (We ask that prospective members attend at least three rehearsals before moving on to the audition process.) Once you express an interest in auditioning, we will assess your voice and invite you to sing with the chorus until we can schedule your audition. 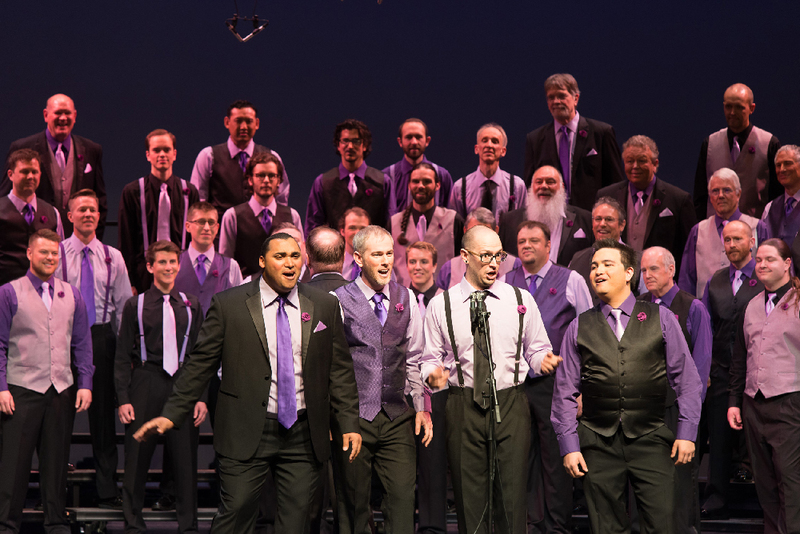 Singing in harmony with the 100-plus members of our award-winning men’s a cappella chorus — all sharing a common passion for music — is an experience like no other. In January and July each year, Sound of the Rockies hosts its Guest Night. This event offers anyone, who loves to sing and has considered a barbershop chorus, the opportunity to join our members on the risers for the evening and get a sense of what it is like to be part of our community. Guests learn about Sound of the Rockies and barbershop style and we get to know you and your voice. Vocal coaches are on hand to help throughout the evening. August 1, 2019 at 6:30 p.m.